IODE knows that children are our future. IODE recognizes that reading builds self-esteem. With our Read for Life program, IODE is working to make Canada the most literate country in the world. IODE recognizes scholastic excellence and helps meet the financial need of students at all levels. IODE has War Memorial Doctoral Scholarships since 1920. IODE knows that children concentrate better in school when they are not hungry. Snack Pack and Food for Thought hampers allow teachers to feed hungry children. IODE supports remote northern communities with school supplies, sports equipment, books, magazines, craft supplies, and clothing. IODE donates to Canadian hospitals, shelters, and crisis centres with hygiene products, equipment, furnishings, clothing, layettes, sports equipment, camperships, and toys. IODE supports Canadian culture, welcomes new Canadians, at Citizenship courts, honours fire fighters and police officers, donates flags to school children and assists with the beautification of parks. IODE honours and provides support to the families of deployed Canadian Forces members through Military Family Resources Centres. 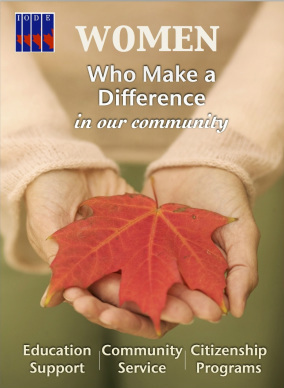 IODE Canada is a national women's charitable organization dedicated to enhancing the quality of life for individuals through education support, community service, and citizenship programs.